← Attribution to the Dead and their whispers of life ! Pounding my skull with more bands from the past, the nostalgia Of PUNK ROCK… I wonder if it will go on forever… maybe so. Gary has a history that is to be respected. He is an iconoclast!! 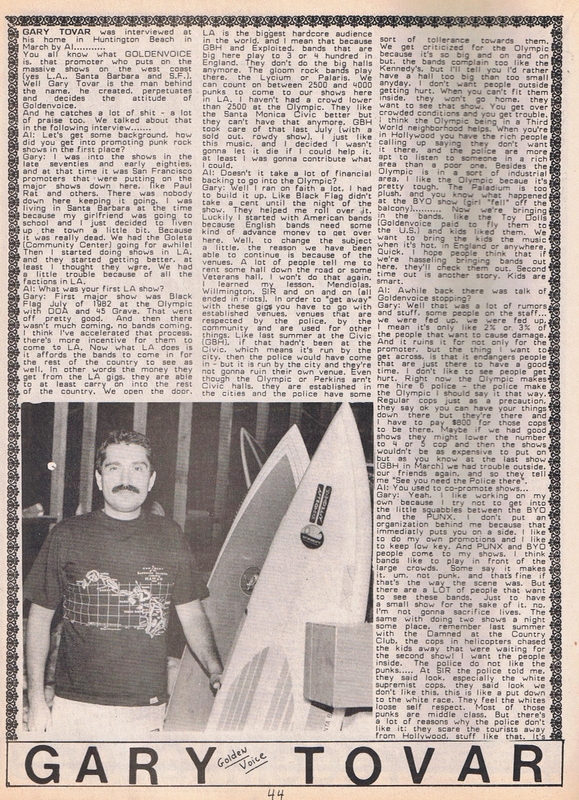 While looking through an old issue of Flipside Fanzine number 42 with Argent Orange on the cover, I found an interview with Gary Tovar. It is from back in the day when punk rock was tight, unknown, growing and fun as hell. I never had as much fun as back stage at a GOLDENVOICE show. I was an innocent babe too. Rolling away from the punches of big man Henry Rollins or meeting fans with their new fanzines who had better ideas than Henry ever had!! Gary and I have had our confrontations but he always knew that I loved the bands just like he did. He really loves music to this day. I think some of us old punks tend to forget how symbiotic the scene was then. We all worked together and supported and grew a scene together. We should try to be content with the imperfections of the past and remember our experience shared more. It was fun being young, wild, and out of control. Yes, some of us documented it. We were not as dumb as you may think!! I will never forget the TODD RUNDGREN show… we all danced and sang each song together… punks, skins and new wavers ! This entry was posted in PUNK NO-stalgia :Punk Rock and tagged Alternative music, Argent Orange, Flipside Fanzine 42, Gary Tovar, Goldenvoice, Hudley Flipside, postaday, PUNK NO-stalgia :Punk Rock, punk rock music, Women. Bookmark the permalink.